Guangzhou recently set in place a private vehicle restriction scheme. Photo by by Abdul Rahman. On June 30th, Guangzhou’s municipal government announced it would implement a vehicle registration quota in order to address the city’s congestion problems and air pollution. As this forthcoming policy combines elements of Beijing’s and Shanghai’s vehicle restriction experiences and clean energy vehicle incentives, it could reduce gridlock and encourage the usage of new, energy efficient cars. Moreover, the synergy between this policy and the progress of public transit development in Guangzhou might bring positive change to the city’s urban mobility system. Guangzhou is not the first Chinese city to implement a vehicle license control policy. While developing countries usually face the choice between supporting the auto industry as a pillar of economic growth and curbing vehicle usage that inevitably leads to traffic congestion, several Chinese cities have taken action by starting to control car ownership growth. The most notable cases are vehicle plate auctions in Shanghai-which started as early as 1994- and the vehicle license lottery or Yaohao in Beijing. Shanghai’s vehicle registration restriction started as early as 1994. It is a monthly auction system granting car registration rights to the highest bidders – currently the price of a vehicle license plate is over US$9,000. Beijing’s vehicle quota, by contrast, was not in place until this past February when traffic congestion had already been long entrenched. The Yaohao lottery gives new car buyers the opportunity to win a car license at no charge, yet only about 2-percent of entrants are granted the right to drive in Beijing. Guangzhou’s vehicle plate restriction arose in a similar context. Currently, there are 10 million people and 2.4 million vehicles in this most powerful economic center in Southern China. As the Mayor of Guangzhou pointed out in a recent interview, conducted in Mandarin, half of Guangzhou’s streets will be gridlocked if the vehicle license control is not in place by next year. From this standpoint, curbing the vehicle growth seems to be a must for Guangzhou. 10% – 12,000 plates will be allocated to environmental friendly vehicles by free lottery –“environmental friendly” refers to vehicles included in an official state catalog of sustainable vehicles “Recommended vehicle Directory for energy-saving and new energy vehicle demonstration project” –or vehicles characterized as small and medium-sized passenger cars with fuel saving ratio higher than 20%. 50% – 60,000 plates will be distributed by a lottery mimicking Beijing’s, however, only vehicles with an engine displacement of less than 2.5 liters are qualified to obtain licenses through the lottery. 40% – 48,000 plates will be auctioned similar to Shanghai’s system – there is no set limit on the highest auction price. Most would not deny vehicle registration control represents progress. Studies show that the vehicle plate restriction in Shanghai has reduced car ownership by at least 200-percent. In addition, this policy aligns with China’s ambitious plans for clean energy vehicles. The national target for cumulative production and sales of pure electric and plug-in vehicles is 500,000 units by 2015. Guangzhou’s vehicle restriction system fits neatly with its status as a “new clean vehicle” city, a nationwide initiative for new and clean energy vehicle promotion. However, as previously noted on TheCityFix, the “cleanness” of the so-called “clean and new energy vehicles” depends on the energy source of the electricity provided; the majority of China’s energy is provided by coal. The incentive for “clean and new energy vehicles” will help Guangzhou put cleaner vehicles on the road; however, it may not reduce net carbon output. 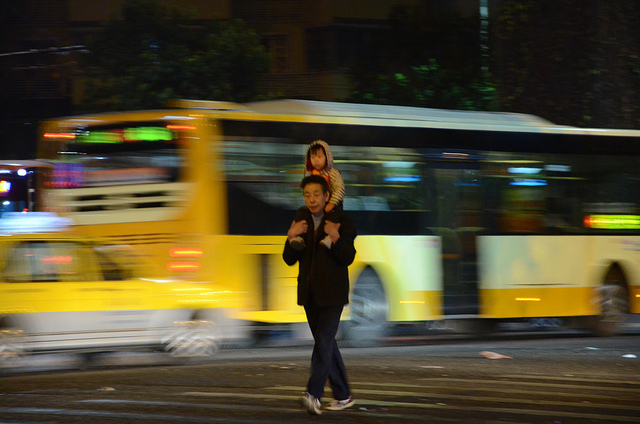 Will this policy solve Guangzhou’s traffic problem? Not by itself, but through the synergy with other public transit projects it may reduce congestion. As Professor Yang Xiaoguang, dean of traffic engineering at Tongji University pointed out, “introducing new policies and auctioning license plates will not solve urban traffic troubles in the long run. The only solution is to develop high-quality public transport.” As vehicle license control policies make private vehicle ownership more costly, and improved public transit gives people alternative mobility options, together they would create a comprehensive sustainable transportation network and bring positive change to urban mobility patterns. Over the past few years, Guangzhou has attracted a lot of attention through its transit projects such as BRT, its greenway bike system and public bike rental program. The city currently operates one of the busiest BRT corridors in the world, with over 800,000 passenger-trips every day.The BRT system is well-integrated with a feeder public bike rental program and a series of greenway bike lanes, which links attractions and public transit nodes, and provides a safe and comfortable space for people to bike and walk along. Expansion of the greenway is still undergoing; with a 200-kilometer increase this year, the total length will reach 2062-kilometers. Meanwhile, Guangzhou also has an active grassroots NGO, Bike Guangzhou. Bike Guangzhou was started by a group of young people in 2010 and this organization has worked very closely with the local government to create a more bikeable environment. This kind of grassroots cycling NGO is rarely found in other Chinese cities. New vehicle control policy would make owning a car more expensive in Guangzhou, but public transit and non-motorized transport infrastructure will help improve the viability and attractiveness of these alternatives to private car ownership. All of these policies and projects working in unison will result in a more comprehensive and sustainable transportation network for the people of Guangzhou.